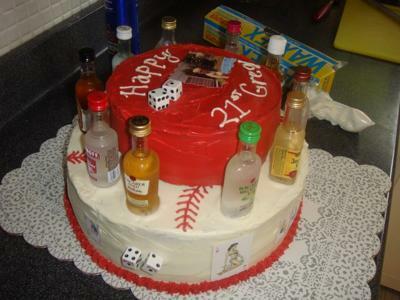 The birthday boy plays baseball and was turning 21, so the bottom layer is a baseball, and then the cards, liquor bottles and dice were just part of the 21st birthday theme. On the top is a picture of the birthday boy when he was little. That's so cute! And are those real bottles and real booze????? ?